Once every decade, the Kurds flicker across the Western world’s radar, usually in the role of victims. Some readers may recall for example, the mega-concert held at Wembley Stadium in 1991, at which Paul Simon, Sting, MC Hammer and Gloria Estefan were brought together by the subsequently disgraced Lord Jeffrey Archer, to raise money for the starvation-wracked Kurds – who had just been pushed into the wintry mountains of northern Iraq, at the end of the Gulf War. Eventually, the money raised by the concert turned out to be considerably less than claimed at the time, and little of it (if any) actually reached the Kurds themselves. As the military campaign against the Islamic State winds down, the United States and its allies’ enthusiasm for using the Kurds as their proxies against the jihadi organization has not translated into long-term military or diplomatic backing and certainly not into support for statehood. Kurdish leaders were always aware of such dangers but nevertheless agreed to go along, seeking a fair reward for sacrifices made: the thousands of lives lost and massive investments diverted from the development of Kurdish areas to recapturing areas of great concern to the United States and its allies but not necessarily to Kurdish forces themselves. Such missions caused deep frustration among the Kurdish public… while majority Kurdish areas still suffered from a lack of basic infrastructure, such as schools and electricity. To make matters worse, the combination of Western abandonment and internal political dysfunction has left the Kurds in a more precarious position [now] than ever. 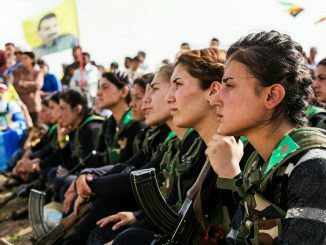 Briefly, the Kurdish hope that their sacrifices in northern Syria would gain them an autonomous region has been subordinated to Turkey’s paranoia about the PKK, the Kurdish political party that Turkey – and the US – still regard as a terrorist organisation. For its part, the West had been more than happy to use the mainly Kurdish fighters in Syria (the YPG) for their own ends against the various fundamentalist groups opposed to the Assad regime. In recent weeks, the Turks have mounted a military offensive against the YPG, while the West has stood by. In northern Iraq, the US was also willing to allow its supposed enemy (Iran) to use its clout with the government in Baghdad to make a deal to push the Kurds out of the towns and cities of the oil-rich regions of northern Iraq, even though the Kurds had just been instrumental in liberating those areas from Islamic State. To be fair, the Kurds have brought some of these recent setbacks upon themselves. Naively, some of their leaders had hoped that US gratitude would enable them to accelerate their previously cautious journey towards independence. Crucially in September 2017, the Kurdish political leader Masoud Barzani held a referendum on independence not only within the Iraqi Kurdistan region, but also in the so-called “disputed territories” also claimed by local Arab communities and by the Baghdad government, and prized for the oil revenues that they generate. Instead of enabling the Kurds to reap the rewards for the sacrifices they’d made against Islamic State, the referendum gambit back-fired, spectacularly. In the aftermath of the referendum, [Iraqi Prime Minister Haider] al-Abadi sent federal troops into the disputed territories to restore Baghdad’s authority. It had lost these areas to Kurdish Peshmerga fighters more than three years earlier, when the Iraqi Army crumbled under the Islamic State’s initial onslaught. In October, after retaking the Kirkuk oil fields, Iraqi security forces then kept rolling, retaking vast swathes of the disputed territories in northern and eastern Iraq – more than what the Kurds had seized in 2014……Iran, which long opposed any move toward Iraq’s breakup, deployed some of the Shiite groups (that it had trained and equipped) against the Kurdish forces, which withdrew in the face of Abadi’s advancing army. Turkey…. [hitherto a Barzani ally] was concerned that secessionist sentiment could spread to its own Kurdish population. It threatened to close its critical border along the Kurdish region and stood aside as Iran brokered a deal that allowed the Baghdad government to push back against the Kurds. For their part, U.S. officials had long opposed any changes to the Middle East’s borders for fear of setting off an unstoppable domino effect, as well as any move that threatened to undermine the Iraqi central government, and publicly told Barzani not to proceed with the referendum in preceding weeks. Washington then took no action when it learned that Abadi had struck a deal with one of the Kurdish groups, the Talabani faction of the Patriotic Union of Kurdistan (PUK), to retake the Kirkuk oil fields without bloodshed. That deal appears to have been brokered by Iran. So, instead of winning the northern oil fields that might have bankrolled their drive for independence, the Kurds are now being pushed back into their previous dependence on the oil revenues decided and distributed by a hostile central government in Baghdad. The failed referendum – and the fact the sacrifices they made in blood and resources have failed to yield any gains – has deepened the bitter internal divisions that exist within Iraqi Kurdistan, between the KDP faction (led by Masoud Barzani and his son Masour) and the PUK, led by the Talabani group. In order to mobilize popular support for the referendum, the Masoud-Masrour Barzani faction of the KDP struck an uneasy détente with PUK leaders who felt threatened with marginalization by the party’s Talabani faction. This gambit encouraged the Talabani group, through Iranian mediation, to seek an understanding with Baghdad and pull its forces out of Kirkuk. The Talabanis’ role was critical….As a result of their withdrawal from Kirkuk, the Iraqi Army, backed by pro-Iran military factions, met virtually no resistance as it advanced. Finally, much the same dire scenario is also likely to play out in Syria. The US has sidelined itself in Syria as well – partly by choice, and partly by ineptitude. Turkey, as usual, remains deeply hostile to the emergence of an autonomous Kurdish enclave on its border and last week, it began taking overt military action against the Syrian Kurds. The two crucial players – Russia and Iran – want to keep Syria intact, which means keeping a diminished Bashar al-Assad in power. Basically, the Kurds have served their purpose, which was to rid Syria of Assad’s fundamentalist enemies. In the virtual absence of Islamic State, the Kurds are now at risk of being seen as the prime enemy of national unity, by all of the main players. This is a dismal prospect for the Kurds. Their failure to achieve a just homeland (when the Middle East boundaries were drawn after WW1) continues to blight their history. By the time of the next election in 2020, the nation’s First Baby will be over two years old. If, as Prime Minister Jacinda Ardern has already suggested, it will take a village to raise this child, the one possible drawback is that the entire nation has now been invited to take a ringside seat on the First Couple’s parenting decisions. While the experience of birth is a great leveller, parenting is always mediated by the resources available; and as Ardern has already and wisely conceded, she does enjoy many advantages in that respect. In other words, I don’t think a sitting prime minister going through pregnancy, birth and the infancy of her child is necessarily a certain vote winner, or a guarantee of Labour’s re-election – as some have suggested. New Zealanders can be a very judgmental lot when children cry or misbehave in public, or are indulged – although any Opposition politician would be playing with fire if they sought to exploit that potential irritation, for party political gain. Ultimately, the wider political framework will dictate how voters come to regard this novel development. A government seen to be selfish or to be governing for an elite, will also have the prime ministerial baby defined in that light. Yet if Ardern and her colleagues govern for all New Zealanders, the First Baby will symbolise our positive hopes for the future, as all babies ideally do. Hey, no pressure. Anna Meredith is a 40 year old British classical composer and electronic musician, born in London but raised in Scotland. A couple of years ago, her album Varmints broke her through to a wide popular audience, and the ferocious “Nautilus” – essentially one gigantic riff repeated with ever increasing insistence – proved to be a track that once heard, was never forgotten. This week, she released a new single “Calion” and it is equally impressive – mainly, as Pitchfork explains, for the way it shifts from sounding like a standard EDM cut in directions that are entirely unexpected.